Every day, tens of thousands of flights move people and goods between airports around the world. Air transport has been growing steadily in recent years, and we have already experienced occasions where more than 200,000 flights have taken place in a single day. There are even times when there are almost 20,000 aircraft flying through the skies at the same time. These are very significant figures. The Asia-Pacific region is home to the largest volume of air and airport activity in the world. In South Korea, for example, every 60 minutes more than 1,500 passengers are transported between Seoul and Jeju alone, at any time of the day and on any day of the year. Atlanta’s Hartsfield-Jackson Airport, in the United States, witnesses 204 passengers taking off or landing on a plane every minute, and Hong Kong Airport shifts 576 tonnes of cargo every hour. However, as in any other sector we could analyse, not all world air traffic is distributed evenly. Even on the busiest days of the year, there are airspaces that remain almost empty, whereas there are other areas of the world that see planes pass overhead every few seconds at any time of the day. 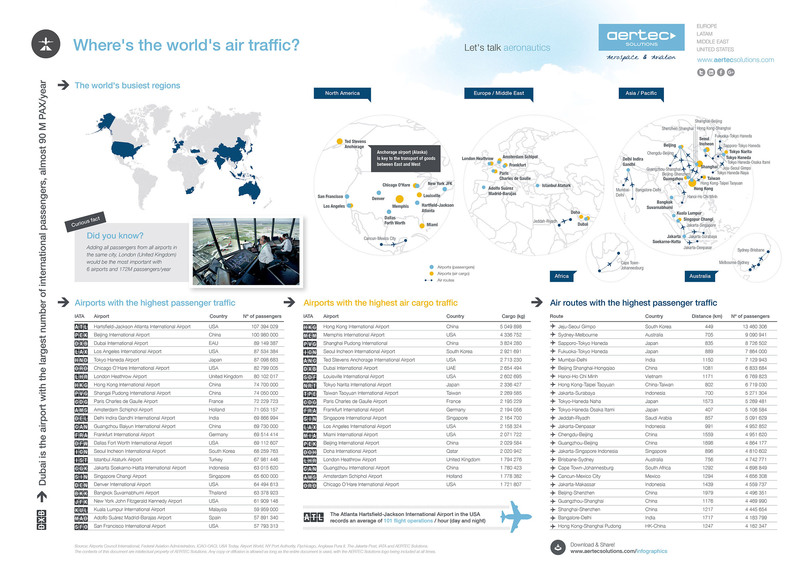 In this infographic we have tried to capture the main airports and routes in the world, in order to get a clearer view of the places where air traffic is most significant. All the data point to the Asia-Pacific area as unquestionably being the world centre of the aviation sector, followed by the United States and Europe. In the infographic, you can see and assess the routes and airports that transport the largest numbers of passengers in the world, and where the largest volumes of cargo are handled each year. Clearly, there are places in the world where air traffic never sleeps. Source: Airports Council International, Federal Aviation Administration, ICAO-OACI, USA Today, Airport World, NY Port Authority, Flychicago, Angkasa Pura II, The Jakarta Post, IATA and own work.